Volkswagen Routan Review: At the beginning of the new millennium, Volkswagen showed off an exciting New Microbus. Featuring the famous boxy proportions, but with up-to-date reclined windshield and modern sensibilities (and a front engine), it would have followed the New Beetle in a wave of nostalgia. I have a 1/38-scale model of it sitting on my shelf. Barbie even got one. But, probably after consulting with their accountants, VW never built it. Regardless, families often want something larger than a five-passenger Passat sedan. If they weren’t smitten with the Touareg SUV, then what could VW offer? The solution is embodied in the Routan minivan. Plymouth Voyagers, Chrysler Town and Countrys and Dodge Caravans ply the streets of the U.S.A. today. Chrysler had the know-how, and, apparently, the capacity. Stylists went to work putting a recognizable VW face onto and plausible VW interior into the newest version of Chrysler’s bestseller. With its distinctive rounded, angled eyes and goatee grille, the Routan looks right in the showroom and on the road. The newest Chrysler minivan, ironically, wears the sharp edginess of a VW, so the rest of the car seems OK without any substantial changes. Matching taillamps and a big VW logo dress it right for Volkswagen duty. Inside the engineers and stylists grafted a VW dashboard onto the Chrysler structure. That means a black, appropriately textured dash top with a rounded instrument binnacle tucked behind the steering wheel holding instruments with familiar graphics. The bulge at the top of the center stack has a traditional squared-off shape that would make any VW owner feel right at home. The three-spoke steering wheel wearing the legendary logo completes the effect. Of course under the hood are Chrysler engines, in this case either a 3.8-liter or 4.0-liter V6. My Nocturne Black midrange SE model had the former, which puts out 197 horsepower and 230 lb.-ft. of torque, earning EPA ratings of 16 City, 23 Highway. I averaged 15.9 mpg. The 4.0-liter, available in the top-of the line SEL model, boosts it to 253 horsepower and 262 lb.-ft. of torque. Oddly, its mileage ratings are better than the 3.8-liter, at 17 City, 25 Highway. Credit a more modern design, with a single overhead cam and 24 valves. Both engines run through a six-speed automatic with a manual shift mode. The shift lever is mounted high on the dash, rather than on the floor, giving extra footroom. The 3.8-liter earns a respectable 7 for Air Pollution in the EPA’s Green Vehicle Guide, with a below-average 4 for Greenhouse Gas score. The 4.0-liter improves the Greenhouse Gas number to 5. For 2009 all Volkswagens feature a standard Electronic Stability Program (ESP). It doesn’t read your mind, but uses a system of sensors and a microcomputer to continuously monitor how the car responds to the driver’s steering input. It then selectively applies individual brakes and modulates engine power to help keep the vehicle traveling along the path indicated by the steering wheel position. If an unstable condition develops, the system instantly uses engine electronics and the brakes to help align the vehicle with where the driver is pointing it. Driving the Routan was painless and pleasant. Although I believe the seats are straight out of Chrysler’s warehouse, they feel appropriately firm. That may be because the Germans made some adjustments to the suspension and steering to give the Routan a more Volkswagen feel. Pulling 4,500 pounds, the 3.8-liter engine felt adequate, utterly unlike any of the snail-like Microbuses of yore, or even the later Eurovan. 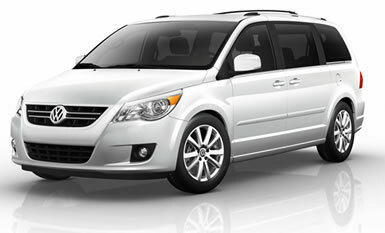 The Routan is a seven-passenger vehicle, and the rear seats fold down to allow for a huge 83-cubic-foot cargo capacity. Chrysler’s quarter century of minivan research and development serve the Routan well. Routans come in three levels, S, SE and SEL. The S starts at $24,700, the SE jumps to $29,600, with the SEL priced at $33,200. Add a $690 destination charge to each of those numbers. Numerous features account for the significant price jumps between levels, for example, the SEL gets the 4.0-liter engine standard. Does it matter that VW is “fooling” buyers with the Routan, built by Chrysler in Windsor, Canada? Sales numbers are low, so the Routan may be a short-lived experiment. However, if you love your Jetta, and really need room for 7, it offers you an option you didn’t have before, even if it’s not a real VW Microbus.